Passed away peacefully at home on November 28, 2018, at the age of 69. He had been battling a-typical Parkinsonism for several years. Beloved husband of Susan Magee. Loving father and mentor of Katherine Herran-Magee (Angad Sandhu) and Alexandra Dever (Mathieu Dever). Cherished grandfather of Saana Sandhu-Herran and Loïc Dever. He will be dearly missed by brothers-in-law Michael and Paul Magee and sister-in-law Jo-Ann Magee, as well as relatives in Colombia. Predeceased by his mother Suzanna Oliveira Lima and father Alvaro Herrán Medina. After graduating from Assumption Preparatory School in Worcester, MA., he attended both Fordham and Columbia Universities in the U.S. followed by law school at Toronto's Osgoode Hall. 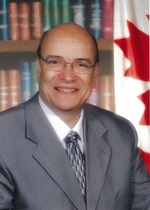 José joined the Department of Foreign Affairs in 1981 and enjoyed a diverse career in Canada’s foreign service that included assignments in Jakarta, Harare, Guatemala, senior positions in Brasilia, Mexico City, and a tour of duty as Ambassador of Canada to Panama. Wherever José went, he stood out as a truly revered friend, colleague and all-round gentleman; he left an unforgettable impression that will long be cherished. A memorial service will be held at a later, to be determined, date. If so desired an expression of sympathy may be made to a charity of donor’s choice. If you have an anecdote to recount about José, his family would highly appreciate receiving it. Feel free upload a story in the ‘’Memories’’, on the left hand-side of this page.